Cyti Web is a program that promises to enrich your browsing experience; however, we do not recommend trusting it because this program has not been created in order to do something beneficial for you. As the research has shown, Cyti Web is nothing more than just an advertising-supported application. It has been released in order to show advertisements because Super Web LLC, which is the publisher of Cyti Web, receives money from pay-per-click websites. The program is compatible with Internet Explorer, Google Chrome, and Mozilla Firefox browsers; thus, the only way to get rid of Cyti Web is to delete it from the system. Continue reading the article if you do not know how to delete this software. This advertising-supported application promises to enhance the browsing experience by providing various tools; however, the truth is that it is not going to do anything like that. According to the specialists at pcthreat.com, you will just see various in-text, interstitial, search-related, and other similar advertisements on your screen. It seems that all these commercials are very intrusive and might even cause harm to your system. Therefore, we highly recommend that you just simply ignore them and stop them from appearing as soon as possible. If you think that Cyti Web only shows ads, you are not correct. Of course, this program is going to show ads; however, it will also collect information about the websites you visit. It will also record your search queries. Luckily, the information Cyti Web is interested in is not personally-identifiable. However, if you do not want to reveal any details, you have to hurry to erase the program from the system. Make sure that you are very careful in the future because programs similar to Cyti Web can enter the system very quickly and you might not even notice how this happens. It is very risky to keep an unreliable program on the system because other infections might slither onto your computer as well. In order to help you delete Cyti Web from the system, we have prepared manual removal instructions for you. They should help you to remove this program; however, make sure that you scan your system with an antimalware tool as well in order to remove Cyti Web fully and check whether there are no other serious computer infections on your system. In case the security application detects them, you will be able to upgrade it and delete threats automatically. Select the undesirable program and then click Uninstall. Locate Control Panel and open it. 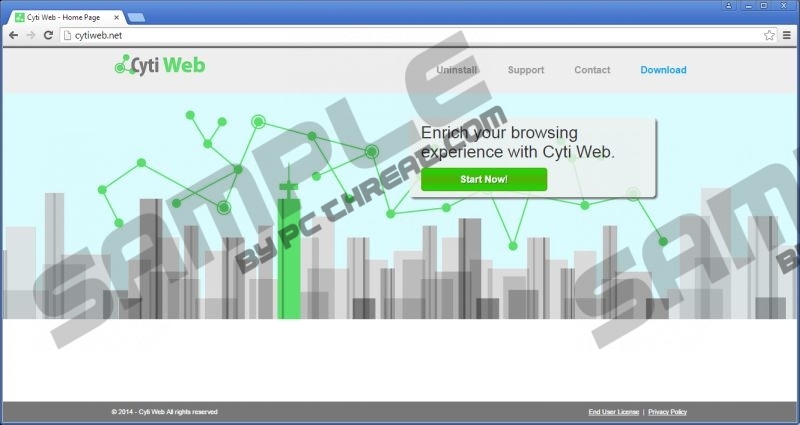 Quick & tested solution for Cyti Web removal. Oh my gosh, thank you so much! This really worked. I was soooooo frustrated. I really appreciate this, since this laptop is new, after all! It tells me I dont have the rights to remove the program, even when I run control panel elevated to admin.